The M42 lens mount is a screw thread mounting standard for attaching lenses to 35 mm cameras, primarily single-lens reflex models. It is more accurately known as the M42 × 1 mm standard, which means that it is a metric screw thread of 42 mm diameter and 1 mm thread pitch. It was first used in Zeiss' Contax S of 1949; this East German branch of Zeiss also sold cameras under the Pentacon name; after merger with other East German photographic manufacturers, the name Praktica was used. M42 thread mount cameras first became well known under the Praktica brand, and thus the M42 mount is known as the Praktica thread mount. Since there were no proprietary elements to the M42 mount, many other manufacturers used it; this has led to it being called the Universal thread mount or Universal screw mount by many. The M42 mount was popularized in the United States by Pentax; thus, it is also known as the Pentax thread mount, despite the fact that Pentax did not originate it. The M42 mount was first developed by Carl Zeiss at their Jena plant in 1938 at the request of the KW camera company for their Praktica line, which had previously used M40 (40 mm by 1 mm DIN). The first lenses were plain stop-down design but many manufacturers extended the M42 lens mount to provide extra features. The first innovation was the pre-select type, which allowed an aperture value to be pre-selected without actually closing the aperture, with a separate ring to close down the aperture quickly to the chosen value. This gave the user the benefit of comfortable framing and focusing with a bright viewfinder and clear focus separation, and then closing the aperture without the need to remove the eye from the eyepiece. A further development followed with "auto" lenses, which have a pin in the mount which closes the aperture against a spring to the chosen setting when it is pushed. This was adopted as a common standard by virtually all lens manufacturers. Cameras designed for these lenses have a bar in the bottom of the mount which depresses the pin when the shutter is released. The first cameras, such as the Praktica Nova range, used physical finger pressure on the shutter button to operate the bar and close the aperture, allowing a stopped-down preview of the depth of field before the shutter fired. However, this function was removed in later Praktica models because some users found it was possible, with longer exposure times, to release the shutter button and open the aperture before the shutter had closed. The bar on Pentax Spotmatic cameras is operated by spring pressure with timing linked to the shutter, but these cameras also had a separate switch for the light meter circuit which closed the aperture and gave the depth of field preview in this way. To allow auto lenses to be used on earlier cameras without the bar, many lenses were provided with a switch or button to put the lens into stop-down mode, commonly referred to as the Auto-Manual or A/M switch. Forward and backward compatibility was maintained in most cases so that the newer lenses could be used on older cameras, and old standard lenses could be used on the newer cameras, but of course without the advanced automation. However, Olympus FTL lenses and Fujica screw mount lenses had a projecting cam which means that they cannot be fully screwed down on a regular screw mount body. Chinon used a different system to provide aperture priority mode with standard Auto-M42 lenses with the CE Memotron (1974), CE-II Memotron and CE-3 Memotron bodies. A similar system was used in the Cosina Hi-Lite EC. These cameras retained the facitlty of closing the aperture with finger pressure on the release button so that the image could be framed and focussed normally with the lens wide open. As the shutter button was depressed the lens would firstly be stopped down to the selected aperture, then the meter would be switched on and a reading taken. Chinon used a then-modern Silicon (Si) metering cell with fast reaction time compared to the then-standard CdS cells, which made it possible to close the aperture, meter the light and set the shutter speed automatically in one full press of the button. While this method did not offer the same sensitivity advantage of true open-aperture metering, it was much more versatile as it did not require specially-equipped proprietary lenses. Both Cosina and Chinon sold their cameras to various other companies for rebranding, which increased the number of almost identical cameras considerably. Compatibility problems have been experienced when mounting lenses with aperture transmission levers (e.g., SMC Takumars) on older bodies such as Zenit-E or Mamiya DTL. The aperture lug or a pin can interlock with the screwheads affixing the mount, which then impedes lens removal. M42 mount cameras fell out of general production during the late 1970s and early 1980s, with the exception of the Russian Zenit range. Pentax moved to the Pentax K mount from 1975 onwards, whilst Praktica adopted the electronic B-Mount in 1979. It was briefly revived with the Cosina-made Voigtländer Bessaflex TM launched in 2003 but this was discontinued in 2007. M42 lenses are still in production at KMZ and at Cosina (under the Voigtländer brand and the ZS line for Carl Zeiss). M42 adaptors exist for many current lens mounts; here, a Pentacon 50mm M42 lens is mounted to a Canon EOS body. Due to the simplicity of the M42 lens mount and the large selection of lenses, M42 adaptors exist for all current and many obsolete lens mounts. The adaptor fits between the camera and the lens, making it possible to mate an M42 lens to a body with a different lens mount. M42 adaptors work best on bodies with a flange depth less than or equal to the M42's flange depth, which includes the popular Canon EF-mount, the Pentax K-mount, the Minolta/Konica Minolta/Sony A-mount, the Sony E-mount, the Samsung NX-mount, the Fujifilm X-mount and the Four Thirds System including the Micro Four Thirds system. This allows the lens to be physically mounted the correct distance from the film or sensor, retaining the original focus range of the lens without the use of correction optics. 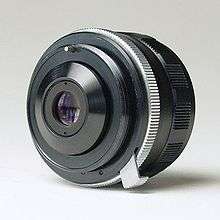 Some M42 lenses extend too far into the camera body, causing interference between the mirror mechanism of the camera, and rear element or aperture pin of the lens. This issue is most commonly encountered with certain Takumar lenses adapted to Canon full frame cameras. On bodies with a flange focal distance greater than that of M42, most notably Nikon, three options are available. A simple mechanical adaptor allows the lens to be mounted, but the effect is similar to the introduction of an extension tube, reducing the minimum focus distance at the expense of losing infinity focus. Alternatively, an adaptor with an optical element can be used to retain the original focus range of the lens, at the expense of some image quality. Finally, it is possible to replace the M42 mount on some lenses with the desired camera mount, or to perform the reverse change on a camera body. The level of functionality available from a modern body when an M42 lens is mounted may vary. Some bodies may be operated in aperture-priority mode, others will only allow full manual control in this circumstance. Focus confirmation may not be available. Mounting an M42 lens on a digital SLR with a sensor smaller than 35 mm film results in FOV crop. Canon: All DSLRs need full manual control. With certain adaptors, metering and focus confirmation is available. Nikon: All DSLRs need full manual control. Focus confirmation is available, focus to infinity is possible with adapter with glass part. FourThirds: All DSLRs need full manual control. Image stabilisation works. With certain adaptors, metering and focus confirmation is available. Pentax: All DSLRs allow aperture-priority with focus confirmation and infinity focus. Image stabilisation works. With grounding one contact on the camera with foil, focus-trap is also available (on Models which have it). Minolta/Sony A-mount: All DSLRs need full manual control. Metering works and lens can focus on infinity. With chipped adaptors focus confirmation and image stabilisation are also available. Some SLTs are reported to work fine in aperture-priority mode (A65 confirmed). Sigma: SD9 allows auto exposure with aperture-priority mode, infinity focus and focus confirmation. User needs to calibrate camera for each change of aperture on the lens by changing aperture value on the camera.